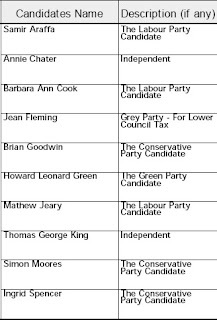 That's interesting, not only are the BNP fielding a candidate in Margate again but there seems to be lots of healthy political competition in Westgate, looking at the list of candidates for the May 3rd elections, published today. One Green, one Grey and two independents should make life interesting on election day. Westgate appears to have more 'non-aligned' activity than anywhere else in Thanet that I can spot at first glance. What is the reason why Anne Chater is not standing as a Conservative? Was she not elected in 2003 on a Conservative ticket? Lots more standing in Westgate this time. Cliftonville Chronicles has a side bar with 2003 results for all wards. Can someone enlighten me.....is Thomas George King the same Tom King who is Chairman of the Westgate Residents Association ? If so, will he now do the decent thing and resign his position, thereby abiding by the ruling that the R.A. remains 'a-political' and also at the same time giving someone else a chance to Chair this elite little club that is so poorly attended except by his cronies. I am a resident of westgate as for as long as he has held control I have refused to join, now, maybe, I can look at getting involved more. I am assuming that this is one and the same person, if he is, isn't this an opportunity for the TDC to withdraw funding as he has broken the rules. Same Tom King and your not the first to wonder about the Residents Association conundrum with its chair standing. A degree of reticence is observed here by Dr Moores, Has Cllr Chater been deselected in your favour? What is the background here? I wasn't impressed over-much by Cllr Chater but did she deserve to be de-selected? Annie Chater was was only dropped because the original selection meeting was cancelled, which is unusual because the timetable for selection is normally set in stone by the Association rules. Annie was on a booked holiday when the date for the selection was to take place. Annie has support within the party and her nominees are a testament to that. It's not for me to comment I'm afraid other than that 1:58 is substantially incorrect. Godd for Annie standing as an independant. A pity some more who think they have the best interests in Thanet do not throw off the mantle of Political bias. Then they could really say what they think, and not what the political masters want. Anyway, anyone who has met the Westgate ghosts ( never seen councillors ) will know who should have been deselected!!! The decision to de-select the councillor, I believe, was never challenged by her. Her attendance record at TDC and her case load as a sitting councillor was the worst on record. That takes some doing ! I also believe Dr. Moores was not selected to 'replace' her, there were several candidates and as he was the only one who actually lives and takes an active interest in Westgate itself, that would have been one of the 'persuading' reasons. The rules were adhered to clearly and as Ms. Chater did not make any challenge to the de-selection process - which is lengthy and the decision would have been made two months prior to the actual event - and she would have been made aware of her pending de-selection, then I do not understand why any reader is concerned for her. This is the place to tell others of the wonderful work she did for people, so come on.....let's hear of the many tasks she undertook, let's us know what she actually did in the last 4 years ! Knocking Dr. Moores for having been selected is unfair, this is a democracy and anyone could have stood for the vacant seat, or is it a case of 'empty vessels make the most noise' ? What ever the case, the voter will decide and we can all watch with interest to see how many votes this Independent candidates gets ! When her friends have voted for her, I guess it will not be enough to win her seat back....we shall see. I also look forward to seeing Tom King do the honourable thing for the good of Westgate Residents Association, if indeed he is prepared to loosen his grip on his 'power'. Where is 1.58 getting his/her information from ? He/her is wrong. Are you going to resign then Tom King ? I heard Chater was given an ultimatum by Ezekiel to attend an important financial meeting and as she was scheduled to be abroad on holiday at the time and didn't want to pay an extra £400 for a flight home then Ezekiel deselected her. Tough but fair? You decide. Surely her record can't be worse than Bowen Fuller, Salmestone Con Cllr who was actually kicked off recently as he was the original invisible Cllr, Salmestone resident's only other Cllr was 153 year old Charlie Young ( well, mid 90's actually) who hasn't done much at all since the last election due to illhealth, not entirely unexpected at his age. The goodhearted and passionate about Margate Iris Johnston (Margate Central, Lab) carried some of his workload but is a busy enough lady in her own right and couldn't make much of a diference for Salmestone. Us Salmestone residents look forward to some improvement soon in their representation. If you heard that then you will probably know how far in advance full council meetings of that kind are arranged? Talking of deselection, what did John Fullerton do to be deselected. You tories are a odd lot, you ditch a councillor like John Fullerton and take on a Labour cast off to stand in Dane Valley who's maths are not what they should be, weird. Samestone? Isn't James Maskell standing for the Tories here? and resign if he's successful. It's a pity you hide behind a pseudonym we could make sure you don't ever become a memberif we knew who you were - we can do without people with your attitude. They're off! Election fever has started and the knives are already out!! A political party candidate for the forthcoming election has been visiting residents in Westgate advising them it will be a wasted vote if they for vote for the Independent candidate. His words "he won't be on any committees and won't have any say". That's probably true if TDC have a "closed shop" policy but as an Independent he will have a voice at Council and public meetings with the public and local media present. I myself am pleased that we have, what I consider to be, a very strong contender in Mr King. In his cpapacity as Chairman of the Westgate and Westbrook Residents' Association over the past six years he has taken on several issues on behalf of local residents and with the backing of the residents concerned has won. As far as I am concerned I can vote with confidence this time because I know the person I am voting for, trust his judgment and I am confident he will continue to do in the future what he has been doing in the past and that is working for the good of Westgate and its residents. That's far better than putting a cross beside the name of someone I have never met as happened last time. Isn't that what I said to Tom when we had a drink in the Nottingham Castle and he asked if I would consider running as an independent? To be sure, if there is a strong Conservative majority on the council, the independents will be pushed to the fringes and that, I believe, would not be such a good for the people of Westgate, if they vote independent in terms of influence and I said as much and Tom did not disagree. If however, independents are returned "en masse" in Thanet, it might be a different story, but statistically and practically, I think the swing may not be sufficient to risk wasting a vote or even splitting it. I agree with your comments but don't agree that the ruling party should govern without listening to the local residents. This is not democracy. I quote Dreamland, Turner Centre,destruction of listed buldings, KCC leader being paid nearly £500,000.00 annually, £80,000.00 spent on the proposed setting up of a KCC website all this while it has been proposed to close libraries, make staff redundant and increase charges for disabled people. Is it the policy of local Councils with the ruling majority to "block" any input from the minority groups even though they may be speaking for the people they represent? Will the majority party turn a deaf ear as they appear to have been doing so during the past 4 years. Without an Independent candidate for Westgate, for the first time since I have the privilege of voting, I would have been in the awful predicament of considering not voting at all. I get the impression from your comments that a party with an overall majority on the District Council closes rank to shut out anyone who doesn't agree with them by disbarring them from any committees or activities. Am I right? The same Eileen from the Gazette story I assume? Please remember that I choose not to make any comments surrounding the candidacy of anyone in Westgate. I take your point but once again I think you need to look elsewhere and consider the influence of independent candidates following any election. Under proportional representation, as in Scotland, independents can influence the direction of policy if they work together in a split Parliament, i.e. SNP and Labour but elsewhere, unless you have a significant block of independents working in concert - a small party - the argument prevails that while they can vote, such influence as they can bring to bear is limited when one party is dominant. This is where you have to decide to place your vote on election day. Practically, which one of the candidates is most likely to achieve the best results for the community over the longer term. One on the inside of the political decision making process, one in opposition or an independent candidate on the outside? Your choice! I fully appreciate your comments and appreciate that you wish to refrain from responding to electoral comments. Yes you're right I am the same "Eileen" as quoted in the Gazette I am not afraid to put my name to any comments I make. "don't vote Independent it's a wasted vote they won't have a seat on any Committee".Are you able to tell me what the policy is re electing Committee members - is it only the ruling party members considered? Surely, as you say, proportional representation comes in and as far as I am concerned there should be at least one of each of the minority groups included to represent the residents who vote for them. No more comments after this I promise - I'll just hope for the right result on May the 3rd!!!! Surprise surprise the "big" boys must be getting worried - the residents of Sherwood Court had a visit from Sandy Ezekiel on Saturday morning - not one of the local candidates who were accompanying him knocked on my door but Mr Ezekiel did. I wonder why? I've lived here for fourteen years and this is the first time I've had a face to face talk on the doorstep during an election period. I suppose I should at least say thank you to Mr. Ezekiel for that. The Machine that Goes "Ping"
A Wish List for Westgate? The Best of a Bad Job?